EPC certificates explained - Which? What is an energy performance certificate (EPC)? Example EPC certificate How to improve your energy efficiency rating What is the EPC register? EPC checker explained How long does an energy performance certificate last? An EPC is a certificate that shows how energy-efficient your property is. The document includes estimated energy costs, as well as a summary of your home's energy performance-related features. 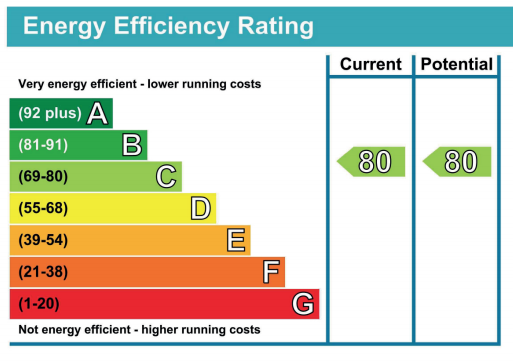 EPCs also include recommendations on measures that would make your home more energy-efficient, along with estimated costs for implementing the changes and the potential savings you could make. Your property will be given an energy-efficiency grade between A and G, with A being the best - ie most energy-efficient - and G being the worst. New-build homes tend to have high EPC ratings, while older homes often have lower ratings of around D or E. The average EPC rating for a home in the UK is D.
Do I need an EPC if I'm buying or renting? It's the seller's or landlord's responsibility to arrange an EPC, but it's still important that you - as the buyer or tenant - see and understand the certificate. It's a legal requirement to have an energy performance certificate for your home before you sell it. This can be arranged through your estate agent or directly with an EPC provider. Make sure you receive an EPC from the seller. You can use its recommendations to inform any renovations you might want to carry out, or even to try and negotiate the property price. If you're a buy-to-let landlord, it is now a legal requirement that your property has an EPC rating of E or above before you can take on a new tenant or renew an existing contract. By 2020, this rule will apply to all properties with existing tenancies, too. Ensure your landlord sends you an EPC before you move in, and use the cost breakdown to help plan your budget. Download this EPC to see an example of what one looks like. An EPC will list ways to improve your rating and give indicative costs. These improvements will help you, your buyer or your tenants save on bills, and lessen the environmental impact of the property. Insulation for your floor, roof, loft or walls. Better insulation reduces the need for heating, thereby lowering your energy bill. Double glazing: windows keep in significantly more heat when they're double-glazed, again reducing the need for heating. Solar panels: these produce cheaper, greener energy. See our advice on solar panels for more information. Low-energy lighting: a smaller change that involves no structural alteration, using low-energy light bulbs is a cheap, easy way to lower energy bills. total potential savings, and the energy performance rating you might receive after making improvements to your home. The EPC register is the government's online database of every EPC in the UK. You can use the EPC register in several ways. Using the register's EPC retrieval page, you can search for a property's energy performance certificate by postcode. This is useful for looking up your own certificate, or for finding the certificate of a property you are considering moving into. If your property doesn't already have an EPC, you'll need to get one before you can sell. Many people do this via their estate agent for convenience, but this is generally the pricier option. To save money by arranging your EPC independently, search the EPC register's assessor page to find an accredited domestic energy assessor. They were first introduced in England and Wales in 2007 so, depending on when you moved in, your property may already have a valid certificate. Use the EPC register's look-up tool to check if you have one - and, if so, whether it's still valid. How much do EPCs cost? EPCs can cost up to £120, although the price is much lower for most properties. While all homes need to have an EPC before they can be sold or let, there's no benefit in choosing a more expensive provider, so make sure you shop around for the best deal. Going directly to a domestic energy assessor rather than getting one through an estate agent is generally cheaper. If you're selling in Scotland, you'll need to get a Home Report. Home Reports include an EPC (known as an energy report), a house survey and a property questionnaire. According to the Royal Institute of Chartered Surveyors (Rics), they should cost between £585 and £820, depending on the size of the home. It's worth getting a quote from your estate agent and a registered surveyor for the survey and energy report. The Scottish government website provides a list of EPC-approved organisations. Homeowners in Scotland have to display the EPC somewhere in their property, for example by the boiler. Since 2013, listed buildings have been exempt from EPCs, provided they reach certain minimum standards for energy performance. Ironically, the best way to check whether your building meets these standards is to get an EPC. If your listed building already had an EPC before the exemption came into place, you will have to make sure it has an E rating before you can rent it out. This may require some changes. Many common EPC-recommended measures, such as installing insulation or double glazing, can harm the authenticity of a listed building, so it's understandable if you want to try and avoid these. Efficiency improvements which will cause minimal harm to the aesthetics or structural integrity of a listed building include switching to a renewable energy source, installing a more efficient boiler and draught-proofing. If you need an EPC because you're selling your house, we’ve teamed up with estate agent comparison service GetAgent to provide sellers with a way to find the best high-street estate agents based on past performance. Use their tool for free by providing a few details about your property or read more about how it works.